The famed Fisherman's Wharf in San Francisco is a must see for all first time visitors. Yes, the neighborhood is touristy, but that's only because there are so many things to do here. Are you not sure where to start your journey? Below you will find an itinerary for what I consider "The Perfect Day in Fisherman's Wharf". While you can't visit everything in a day, this journey allows you to hit many of the hot spots without having to backtrack through the neighborhood. 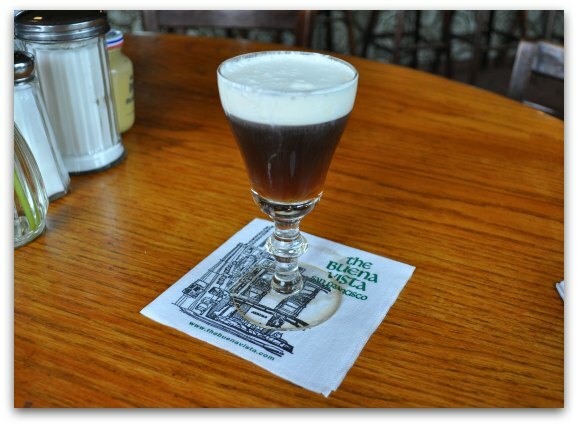 This famous cafe is the first to introduce Irish Coffee to the US (pictured above). All of their dishes include huge portion sizes. You must also top it off with one of their famous Irish Coffees. My favorite breakfast here is the Crab Benedict made from fresh crabs caught in the local area. They also serve other favorites such as scrambled eggs, cinnamon French toast and corn beef hash. It's next to the cable car turnaround on the corner of Bay and Powell Streets. See pictures and find out more about the Buena Vista Cafe. 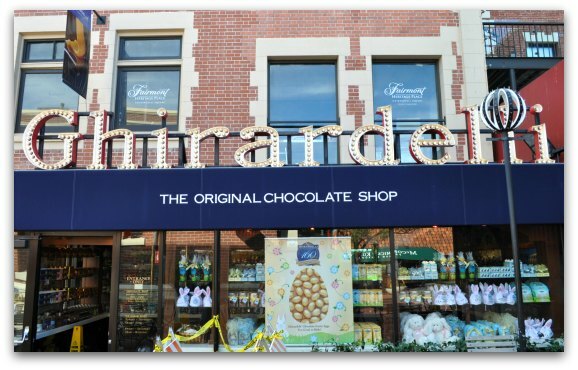 Walk one block west to visit Ghirardelli Square. This historic building once housed the Ghirardelli Chocolate Factory. Even though the factory moved out long ago, you can spend some time walking around this famous square shopping and even sampling some of its famous chocolates at no charge. You could spend at least an hour here just strolling through each store. 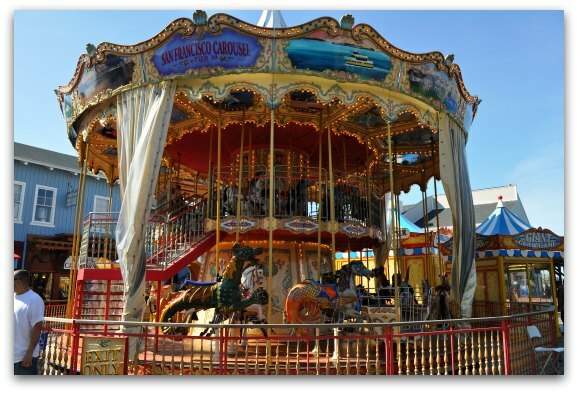 Learn more about what there is to see and do at Ghirardelli Square. Walk through the Historic Maritime Park to the waterfront where you will find the Hyde Street Pier. This area of Fisherman's Wharf features five historic ships, all with unique stories. You can see an old car ferry that was used before the Golden Gate Bridge was built, a steam powered tug boat form 1907 and a square rigged ship built in 1886. You can stroll along the pier or pay $5 to enter three of these historic ships. See pictures and discover more details about the Hyde Street Pier. 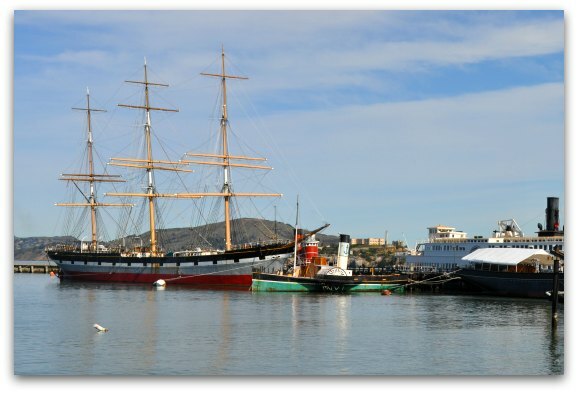 After a visit to the Hyde Street Pier, walk across the street to the Maritime Museum. It's on the corner of Jefferson and Powell Streets. 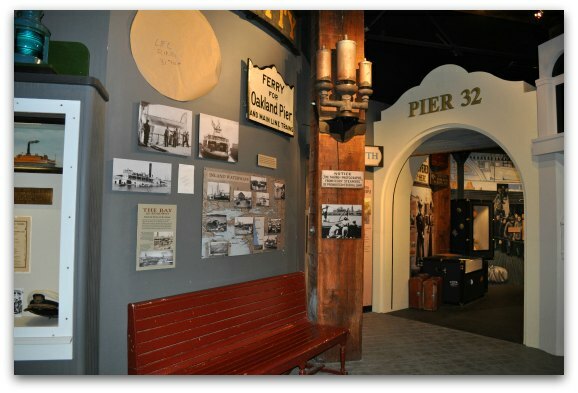 This free museum walks you through the history of Fisherman's Wharf. 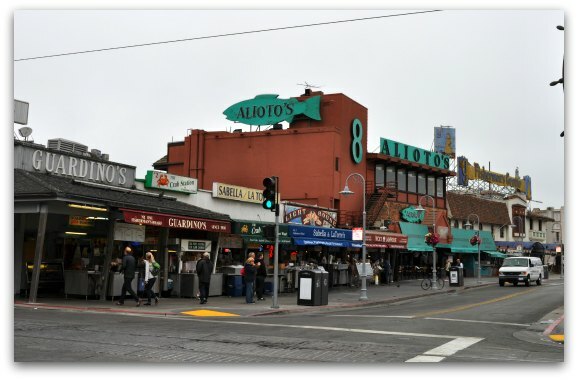 With pictures, videos and other interactive displays, you will learn all about how this area got its name, its first inhabitants and how those both shaped the Fisherman's Wharf we know and love today. See pictures and read more about what you will see at the Maritime Museum. Now it's time to head over to Fish Alley for some freshly caught lunch! It will take some time to digest your huge breakfast, so I doubt you will be hungry before now. From the Maritime Museum, head east toward the huge Fisherman's Wharf sign. It's about three blocks away. Right across the street from this sign is where you will find several small lunch vendors. This is Fish Alley. Walk up and down a couple of times before making your selection. It's one of the best places to grab lunch in the area. Once you grab your lunch, head toward the water to find a spot on a bench to enjoy your meal (at times they also have a handful of tables nearby so look around before heading to the waterfront). If you are not a fan of fish, then head over to In-N-Out for one of the freshest and yummiest burgers in town. The lines will be long, but they typically move fast. Don't worry about seating, head back toward the waterfront and enjoy your lunch outside! The In-N-Out is in Anchorage Plaza, right on Jefferson Street. You can't miss it's bright yellow and red signs. Once you've had a chance to digest your lunch, it's time for a bay cruise! Stroll over to Pier 43 where you will find the Red and White Ferry Fleet. Buy a ticket for the 3pm cruise and get in line. You can also buy your ticket in advance and exchange your voucher for a ticket (check on Goldstar to see if you can get your ticket for up to 50% off the full retail price). 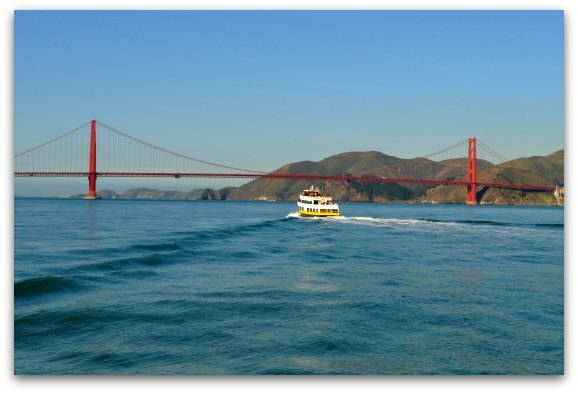 At 3pm, you will hop aboard your 60-minute bay cruise for an unforgettable adventure on the SF Bay. Once you return to shore, head east along the waterfront to Pier 39. Your first stop here is the Aquarium of the Bay. 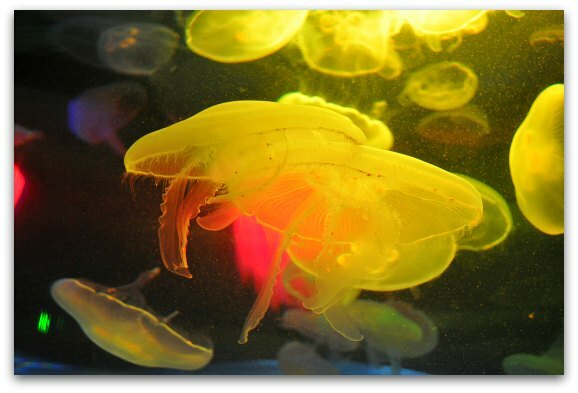 In the summer, they are open until 8pm, which gives you plenty of time to walk around the aquarium. In the winter, they close at either 6pm or 7pm, so check the closing time to ensure you have enough time to visit. It takes anywhere from an hour to an hour and a half. See pictures from my last visit and learn more about what you can expect. Insider's Tip: Stop by the California Welcome Center to pick up your free Pier 39 Fun Pack when you arrive. It offers discounts to many shops and restaurants on the pier. You will find the California Welcome Center on the second floor near the Fog Harbor Fish House. It's open daily from 9am to 7pm, except on Thanksgiving and Christmas Day. The rest of the night, you are free to explore Pier 39. This remodeled fishing pier features dozens of shops, restaurants and several fun activities. I recommend visiting the sea lions, sampling some local California wines and walking through the Magowan's Infinite Mirror Maze. You can also grab dinner here. If you are traveling with kids, then you should check out the Wipeout Bar and Grill where they have great burgers and outdoor seating. If you want something a little nicer, then head upstairs to Neptune Waterfront Bar and Grill where you will get some of the best views of the bay (and maybe even catch the sunset). The shops on Pier 39 stay open until at least 8pm (even later during the summer and on weekends). Most of the restaurants stay open until at least 10pm (sometimes even later in the summer and on weekends). Find out more about Pier 39. An alternative to the Aquarium of the Bay and Pier 39 is the night tour to Alcatraz (if you are able to get tickets). This is my FAVORITE time to visit this historic federal prison. The group sizes are small and they open additional sections within the prison for night visitors. It's open for night tours Thursday - Monday and the tickets go FAST (which is why it's an alternative option instead of my first choice). Click here to learn more about the night tour and what you can expect during your visit. If you plan on taking this journey, it might be easier to print a copy to take along. Click here for a simplified, printable version of The Perfect Day in Fishermans Wharf itinerary. The easiest way to get here from Union Square is to take the Powell/Hyde cable car from Union Square. Don't pick it up at the beginning of the line at the Powell Street cable car turnaround point. Instead, pick it up at the corner of Powell and Post Streets (grab the one going uphill). By picking it up here, you will avoid the long lines at the cable car turnaround just a few blocks away. Are you interested in staying in Fisherman's Wharf? This is the second most popular neighborhood for visitors to stay during their visit. Many of the hotels are just a block or two from the action, so you can always stop by your hotel to recharge during the day. It's perfect if you plan on spending most of your time in this neighborhood. You also have several public transportation options to get you to other parts of the city. Before you book, make sure you check out my Fisherman's Wharf Hotel recommendations to find the hotel that is right for you! One tip I like to give everyone that visits is to check out the half-priced tour and event tickets on Goldstar before booking anything. This discount retailer is my favorite because they have an AMAZING selection of tickets from theater productions to bay cruises. They often post their tickets about two months in advance and the selection continually changes. By buying your tickets on Goldstar, you can stretch your dollar and see even more of what San Francisco has to offer. Find the current list of discounted tours and event tickets on Goldstar today! Note: You will never find Alcatraz Tickets on sale on Goldstar (or anywhere else), so please buy them the minute you know you plan to visit. I don't want you to miss out on one of the best SF attractions! Click here to learn more about Alcatraz visits and what else you need to know before booking.